There are so many compelling reasons why beach beer = best beer. You're hot, temperature-wise; beer is cold. You're basically naked and maybe not-so-hot, hotness-wise; beer goggles work on your own lacking lump of flesh. 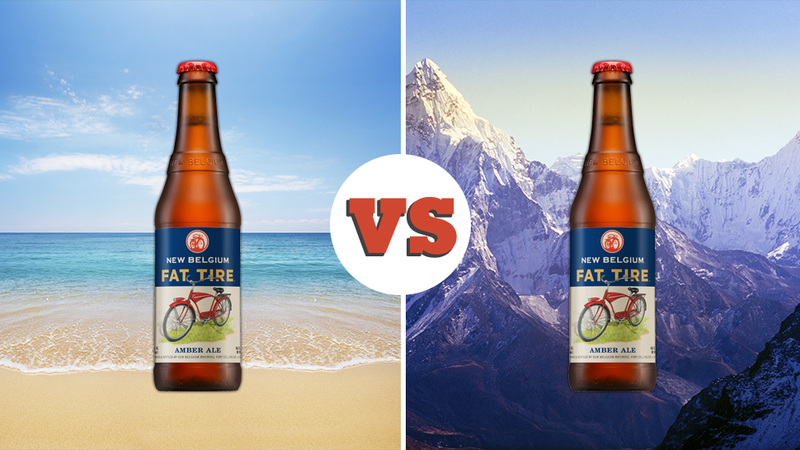 You're either reclined (perfect for a beer!) or playing Smashball (thirsty!). There's no denying it: beach beers are a many-splendored thing. On the other hand, a mountaintop is as nail-on-the-head as you're gonna get for you cliff-scaling, actual-air-loving, sunset-gazing types. No one knows how or why, but somehow you made it up to the tundra. You've just exerted unthinkable force, you're accomplishing things. You've earned that beer. (Technically boring old water is probably a better choice, but where's the reward in that?) Besides, we all know what altitude does to alcohol, wink nudge. Whoever makes the most compelling [read: recommended, replied to, insane] argument will win a trip for two to San Diego to ride dirty with the Chopaderos at the Tour de Fat on September 27, 2014. So get your claws out, pick a side, and make your case in the comments. Contest is open to those 21+. Please review our contest rules here. The winner must provide proof of age. Gawker Media will verify the winner's identity before fulfilling the prize. Contest ends 7/23/2014. Good luck!